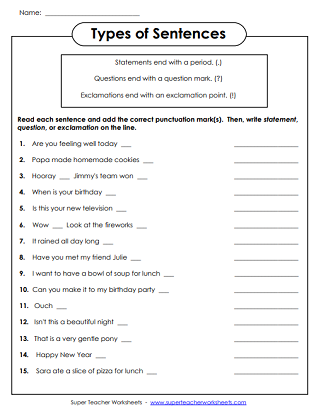 These worksheets will help you teach everything from periods, exclamation points, and questions to commas and quotation marks. Choose the correct punctuation marks for each sentence. Add a period to the end of each statement. Add a question mark to the end of each question. Choose the correct punctuation mark for the end of each sentence. Choose from period, exclamation point, and question mark. Tell whether each sentence is a question, a command, or a statement. Cut out the sentences and paste them in the correct category. Tell whether the sentences are questions or statements. Draw straight lines to match each punctuation mark with its name. Draw straight lines to match the punctuation marks with their descriptions. Unscramble the words to make a statement and a question. Add periods, commas, and capital letters to fix the addresses on the envelopes. Correctly re-write each date. Place the comma in the correct place and use proper capitalization. Part 2: Explain what is wrong with the way each date is written. Use commas after the words yes and no. Each of these sentences includes a series. Add commas between each item in a series. 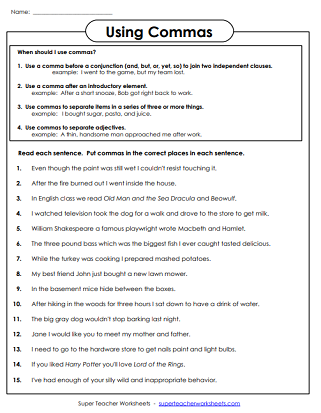 Add commas to the sentences on this worksheet. Includes commas between coordinate conjunctions, independent clauses, and items in a series. Practice using apostrophes in contractions and possessive nouns. 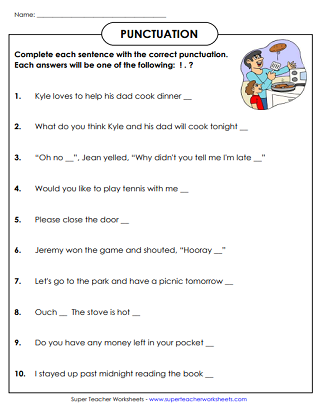 Worksheets to teach students about capitalization of sentences, names, dates, and places. This page has activities for teaching your students about using quotation marks in dialogue. Proofread the paragraphs to correct the punctuation, capitalization, and spelling errors. Use these printable worksheets to help students develop their writing skills. Learn to abbreviate days of the week, months of the year, people's titles, states, and measurement units.